Robert Burch spent his childhood in Atlanta, Georgia. At the age of 10 he moved to Tokyo, Japan for 3 years, then moved back to the same house in Atlanta. High school education tossed him around the country from Gainesville, Georgia to Carbondale, Colorado. 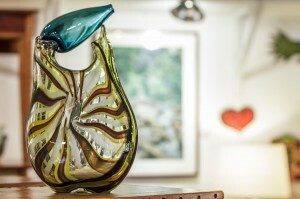 While in Carbondale, his passions ignited with the use of the art facilities; taking a special interest in glass blowing, while still silversmithing, painting, drawing and shooting photographs. In early high school years, he had photos in the Aspen Art Museum, Gainesville Art Museum, and earned special recognition in the school art shows. His final year of high school consisted of a month-long senior project. This project took Robert across the state of Colorado to work with commercial photographer, Tyler Stableford, glassblowers Donna Gordon, John Hudnut, Matt Baricevic, and Dave Powers. After graduation he moved back to Atlanta and began work at Duckbill Studios under the skillful eye of Tadashi Torii. After two great years of working for Tadashi, his path took him away from Duckbill Studios. He has taught classes in Carbondale, Atlanta and at Georgia Southwestern University. 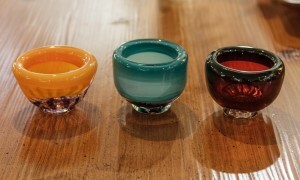 After showing widely across the state of Georgia and Colorado, Robert found himself at the mecca for glass blowing – Seattle. He has been furthering his education and 3D vocabulary at Pilchuck Glass School and embedding himself in the community of artists in the Northwest. While working at an extremely high level of glass making he is building artistic credibility by doing shows in several different cities and forming relationships with creative individuals all over the world.